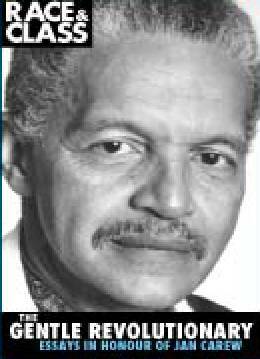 12 "Black Students In Red Russia"
Jan Carew Emeritus Professor Northwestern University, was born in Agricola-Rome, Guyana, South America on September 24, 1920. Novelist, poet, playwright, educator, Carew describes himself as "an inveterate wanderer for whom travel is like the breath of life." In addition to his education at Howard and Western Reserve Universities in the United States, he also studied at the Charles University in Prague, Czechoslovakia (1948-50)and the Sorbonne in France. He was first married to novelist, Sylvia Winter Carew of Jamaica, then to Joy Gleason Carew, a linguist and Russian specialist. Carew was a leader in the field of Pan- African Studies and Black Studies. Jan Carew has served as lecturer, professor or program director at Princeton, Rutgers, George Mason, Hampshire, Lincoln and London Universities. Jan Carew moved to Louisville in Fall 2000 as a Visiting Scholar-in-Residence with the Pan-African Studies Department. An authority on fields ranging from Third World studies to Caribbean literature to race relations, he has also served as an advisor to the heads of state of numerous nations on the African continent and in the Caribbean. Carew entered academia after living for years in Britain as a writer, and in an Emeritus Professors of African-American and Third World Studies at Northwestern University. He is a permanent advisor to the University of Namibia in Windhoek, Namibia and to the St. Petersburg University of the Pedagodical Arts in St. Petersburg, Russia. Carew has been a major contributor to the Journal of African Civilizations and Race and Class. He is the author of Grenada: The Hour Will Strike Again (1985), Fulcrums of Change (1988), and Ghosts in Our Blood: With Malcolm X in Africa, England and the Caribbean (1994). His essays include: "Estevanico: The African Explorer," "Columbus and the Origins of Racism in the Americas," and "Moorish Culture-Bringers: Bearers of Enlightenment." Carew's interest in Malcolm X led him to a search for Malcolm's mother, Ms. Little, who was a West Indian. He reportedly met Malcolm X in London in 1965 and then soon after to have gone to Ghana. Malcolm had visited Ghana not long before and had met Maya Angelou there along with Ras Makonen of Guyana, Nana Kobina Nketsia, a custodian of Akan culture, Kofi Badu of Ghanian Times, the late Nevlle Dawes of Jamaica and his Ghanian wife, Cho Cho and Kofi Baacha of the Spark and others. Jan Carew visited the Soviet Union as a guest of the Writers Union, but was disappointed in the Soviet's "missing the mark" on their road to socialism. Jan Carew, was perhaps the most eminent Caribbean activist of the left community of change to emancipate himself and his line of thought from the apron strings of an invasive state, the USSR. Thus he challenged the USSR's monopoly of revolutionary theory. And its tutelage of the so-called Third World. As a young writer and dynamic theatre personality Carew would have had the promise of ready made promotion and prestige in the soviet half of the world and in a large part of the rest of the world. He paid the price and was the subject of vilification from the left in the Caribbean. The price was heavy but he preserved himself and his tradition as valuable resources for freedom of the down pressed. He had gone to the promising new civilization, which had him as guest of the Writers Union. Moscow was the spiritual home of millions outside of the USSR. Like Padmore before him, like CLR James who had not visited, Jan Carew found some dissonance and wrote critically of the directions." Moscow is not my Mecca." He had disappointed many uncritical admirers of the Soviet system, such as the PPP in Guyana, but he bore it heroically. Carew's difficulty with Moscow was not its official commitment to socialism, but rather its missing the mark. His problem to be sure was not that of deviation, of which he was accused. Circa late 1982, members of the Citizens Committee/Harold Washington for Mayor of Chicago (in formation) included Jan Carew. Alice Palmer, editor of the Black Press Review was elected International Organization of Journalists vice president for North America at the organization's 10th Congress, October 20-23 1986, in Prague Czechoslovakia. She also traveled to the Soviet Union and Bulgaria during the same trip. Alice Palmer's IOJ duties were to include co-ordinating the activities of IOJ chapters in the US, Canada, Mexico and the Caribbean..
Other U.S. attendees included Jan Carew of Black Press Institute, Simon Gerson and Jose Soler of the U.S. branch of IOJ and Gwen McKinney and Leila McDowell-Head of the National Alliance of Third World Journalists. The IOJ was a Soviet front operation, based in Prague until its expulsion by the Czech government in 1995. In 1987 Jan Carew was a Member of the Executive Committee of Chicago based Comprand (Comprehensive Research and Development). On November 10, 1991 Jan Carew was listed as a member of the 1991 Tribute Committee for the Chicago Committee to Defend the Bill of Rights Bicentennial Celebration. One of the featured panels was "The Problem of the 21st Century Color Line, Part 2: People of Color and the Struggle for Unity"; with Daniel Avila, Jan Carew, Esperanza Martell, Louis Reyes Rivera and Sybil Wong. Moderator: Paul Washington. In 2007, Jan Carew (African American studies, Northwestern Univ. ),, was an assistant editor of University of Minnesota based Marxist journal Nature, Society and Thought;. "Black Students In Red Russia"
In January 2009 Jan Carew was interviewd for a BBC program "Black Students In Red Russia". In the Sixties, Seventies and Eighties, Soviet-funded scholarships were offered to large numbers of students from developing countries to enable them to study in the Soviet Union. Presenter Burt Caesar tells the story of these students and finds out what happened to them. Guyanese writer Jan Carew drew closely on the personal stories of students who traveled east for his 1964 novel, Moscow Is Not My Mecca. He shared a house with many of these students in London, a transit point on their journey. The programme includes an interview with Jan Carew, now in his late eighties. In 2009, the Editorial Working Committee of Race & Class, published on behalf of the UK based Institute of Race Relations, included John Berger, Lee Bridges, Victoria Brittain, Jan Carew, Jeremy Corbyn, Basil Davidson, Avery Gordon, Barbara Harlow, Saul Landau, Neil Lazarus, Manning Marable, Nancy Murray, Colin Prescod, Barbara Ransby, Cedric Robinson, Bill Rolston and Chris Searle. Jan Carew has lived in Mexico, England, France, Spain, Ghana, Canada and United States. The men and women that he has interacted with include W.E.B. DuBois, Paul Robeson, Langston Hughes, Malcolm X, Kwame Nkrumah, Shirley Graham DuBois, Maurice Bishop, Cheikh Anta Diop, Edward Scobie, John Henrik Clarke, Tsegaye Medhin Gabre, Sterling D. Plumpp and Ivan Van Sertima. "They all form a veritable pantheon of illustrious African scholars and activists". Carew was also well acquainted with US/British communist Claudia Jones and Guyana's pro-Soviet leader Cheddi Jagan. This page was last modified on 8 July 2012, at 21:44.